USPTO examiners are facing a variety of challenges and pressure while examining patent applications and finding relevant “prior art”. There are various factors affecting the quality of results produced by the USPTO examiners — the number of applications filed each year, time allotted to an examiner for each application, availability of “prior art” search tools to a USPTO examiner, and relevance and amount of prior art submitted by the applicants. These factors do not allow an examiner to perform a thorough “prior art” search. The number of backlogs of unexamined applications (546,286) in USPTO is proof of this. 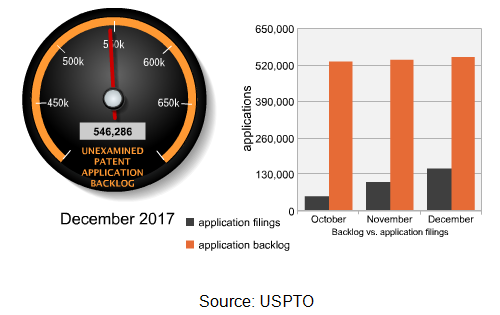 The number of patent applications filed every year is enormous as compared to the limited number of patent examiners which is hindering the process of conducting a complete prior art search by the patent examiner. As per a GAO survey, 45% of examiners feel that the large quantity of patent applications is a major cause which makes it somewhat difficult for examiners to perform a thorough prior art search. As we know while conducting a “prior art” search, we have to check whether the invention is novel or non-obvious. For this, limiting only to US patent references is not an effective strategy and it is essential to search for non-patent literature and foreign references as it plays an important role in establishing the patentability of the invention and also because there is increasing innovation happening in Asian countries like China, Japan and Korea. USPTO examiners use two searching tools right now (1) EAST – stands for Examiners Automated Search Tool. It is a software interface that connects with the USPTO patent database files and (2) WEST stands for Web-based Examiner’s Search Tool. It is an internal USPTO database for use by US patent examiners and patent researchers. Both the tools are an easy way to access USPTO data but information related with foreign patent literature is inadequate as only abstracts are available for some foreign patents. Besides, examiners have to access other web tools in order to find additional foreign patents and that requires additional time. Another major obstacle that USPTO faces is the amount and relevance of prior art cited by applicants. As per the guidelines of USPTO, examiners have to consider the patent and non-patent literature that are cited by the applicants and review them. Reviewing numerous references is sometimes a major concern, as applicants have no burden to explain the relevancy of the references cited. As per the survey “88 percent of examiners sometimes, often, or always encounter applications which are irrelevant” and on contrast “87 percent of examiners find that an application with relevant references makes it somewhat or much easier to complete thorough prior art searches in the time allotted”. So its always better for the applicant to cite more relevant references in the Information disclosure statement rather than citing junk. The recent statistics related to Inter parties review shows that there is an increase in IPR filings, which is an indication that at time of patent examination a through prior art search is required. USPTO can overcome these issues either by outsourcing the patent searching work like JPO is doing or applicants can outsource their patent searching work to other service providers.